Rotterdam and the 50th anniversary of ‘De Doelen’. It is important that the celebration is seen throughout the city and beyond. Marking important reconstruction-icons that belong to the city, also the routing in the city is important and a central place that celebrates the anniversary with a big gesture. The central place carries the voice of the reconstruction, a meeting point, a start for the routing through the city, a place that will put the celebration on the map. The starting point is a route in one building at a prominent spot: the Central Pavillion. The marking of the reconstruction-icons will be completed with elements such as video screens and building signs- they mark the central route and display a photo story - the cultural agencies have their own program marking and there will be collaboration with diverse parties for a deep visibility in content and interaction with the public. A few important icons from the reconstructional architecture will have extra visibility through their special mark. Every mark is ‘site-specific’, meaning that every building will have an individual approach that fits best to their needs, besides the conservation of the uniform appearance of the markings. 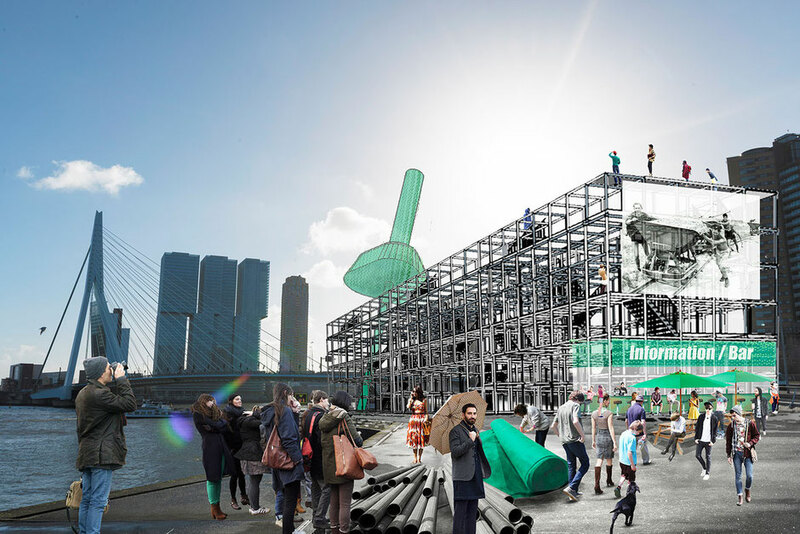 The locations are chosen after an analysis of the reconstructional icons in Rotterdam. The monuments are primarly in the city- triangle and form and interesting route past the rebuild of the city and the cultural agencies.